Figure 2: Kassandra Jackson with the mask of Clytemnestra. The sight of the masked figure, as a purely aesthetic experience, carries us beyond ‘ordinary life’ into a world where something other than daylight reigns; it carries us back to the world of the savage, the child and the poet, which is the world of play. The use of masks in Ancient Greek tragedy was as integral to the performance as was the use of music, dance, choral commentary, and, indeed, poetry. All of these elements are, of course, alien to mainstream modern tragedy—to apply the word “tragedy” loosely to a different thing—and have been for the past century and a half. In deference to contemporary tastes, most performances of Greek tragedy today abandon the original media of performance, focusing instead on the modern essentials of plot, theme, and character. Yet Greek tragedy in an approximation of its original form can still impress us with something of its original force, notwithstanding the gulf in time and mores that separates a contemporary Western audience from the auditors of Aeschylus. 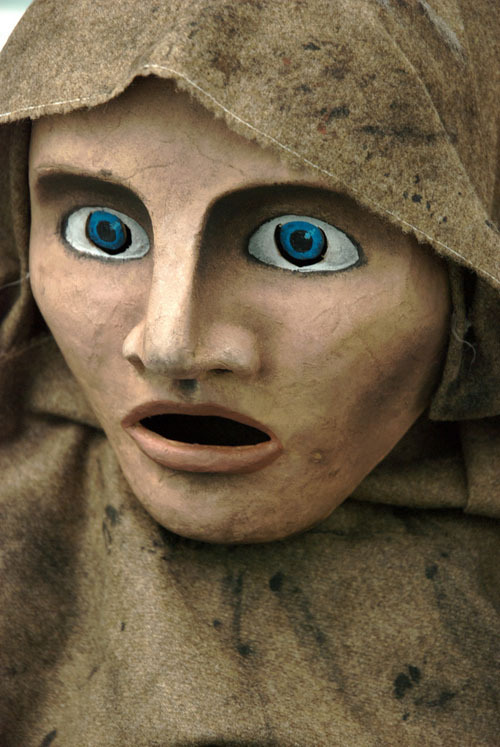 In order to begin to understand and appreciate Greek drama under the performance conditions of the fifth century B.C., actors and audience must grapple with the unfamiliar theatrical modes that developed pari passu with the tragic genre, especially the use of the mask. Unfortunately, we know much less about the use of mask, music, and dance than about ancient poetry. In consequence, reconstructing their use in relation to the texts presents us with technical challenges. Such challenges can only be resolved in practice: authority and logic must always yield to the plain proof of experiment. In recent years, there has been an increasing tendency to recognize the unique point of entry presented by live performance. Scholarship and art can come together to enhance our understanding of the necessary union of form and meaning in Greek drama.1 In what follows, I shall be concerned with my own attempt at a union of scholarship and practice: the masked staging, under my direction, of Aeschylus’ Agamemnon in the original Ancient Greek by members of Oxford University in October, 2008. Before discussing the design and implementation of our masks, however, I shall briefly consider some of the scholars and performers whose work shaped our approach. If we accept these pragmatic remarks as a full answer to the question of why the Greeks used masks, we find that the conditions of theatre have changed significantly enough to render these props obsolete. Intimate indoor venues have replaced large outdoor theaters; powerful lights illuminate the faces of actors onstage; makeup can convincingly make a young man appear old. We no longer subscribe to the convention of using only three actors in any given play, nor are we obliged for social and historical reasons to use only male actors. Technology has made it possible to create plays that are rather like movies, unfolding with smooth verisimilitude before our eyes. As one professor said to me, if the Greeks had had access to these same powerful theatrical tricks, would they have used masks in the first place? These practical observations do not address the fundamental issue of how the art of masked drama worked as a coherent whole. As in any powerful art form, every element in masked tragedy must respond to every other element: none is independent or inconsequential. In this light, seeing Greek drama played unmasked is like reading Greek drama in a book, or like looking at a bleached marble bust of Aphrodite: we encounter a marvelous fragment, a once-essential element plucked out of its context by the historical accidents of textual survival. But tragedy without masks it is not what the Greeks made or experienced. Mask stands at the center of Greek tragedy. Nonetheless, my goal in directing this performance as masked was not a reproduction of the Hellenic original, but rather a reinterpretation or reappropriation. Moving beyond the purely practical, Jean-Pierre Vernant in 1968 argued from a structuralist position that the role of the tragic mask is principally “an aesthetic one.”4 The Greeks were no doubt conscious of the role of beauty in their plays. Vernant’s chief interest is to distinguish aesthetic concerns from religious and ritual ones—that is, to prove that the contained experience of theatre, which the audience knows to be make-believe, partakes of the mask in a different way from the transformative, enthusiastic cults of Demeter and Dionysus. 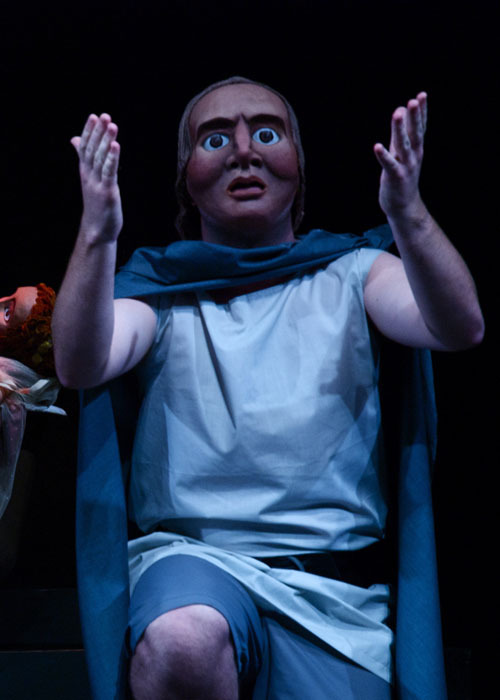 But the aesthetic importance of masks in Greek tragedy bridges the divide between theatre and ritual, both of which rely on the power provided by the fixed expression, simplified features, and unblinking gaze of the mask. The mask, released from the individuality and particularity of the human face, enables the performer or celebrant to transcend ordinary reality. He can become a man, a god, a monster—in theatre, as in religion, the aesthetic properties of the mask are of supreme importance. This became increasingly clear to me during the design and rehearsal phases of our production. Perhaps the most sophisticated study of the mask to be published in recent years was carried out by David Wiles, who approaches the subject from the standpoint both of a performer and of a scholar. Wiles’s own reverence for the mask leads him naturally into the realm of religion. He argues that the Greek mask belonged to a polytheistic culture, and that its use presupposed “propositions or experiential truths” alien to monotheism.5 Because the social and psychological underpinnings of the ancient Greeks were so different from our own, Wiles concludes that no sharp distinction can be made between the theatre mask and the mask of the cult of Dionysus.6 The primary function of the tragic mask, according to Wiles, is not to seal and fix a character type, but “to transform a wearer, and to take power over an audience within the context of a culture where the aesthetic domain did not separate itself off from the religious.”7 “Taking power over an audience” today, without invoking people’s contemporary religious beliefs, requires tapping into an undying awe and fear before the strange and the monstrous. The challenge of the stage is to wed ideas and inspirations to their concrete realization. Despite the centrality and importance of the mask in Greek theatre, surprisingly few productions have attempted their use. Two of the most important are those of Sir Peter Hall in 1981 and Ariane Mnouchkine in 1990-1992. Although more recent productions have also engaged with the mask, these two have proven especially influential; and, as will become apparent below, the design of Hall’s masks was our point of departure in imagining the masks of Agamemnon. The mask reclaimed popular attention on the British stage with Hall’s Oresteia, which debuted at the National Theatre in London in 1981 and traveled to Delphi in the summer of 1982.8 Jocelyn Herbert, who designed the masks for the production, created sculptural, almost geometrical masks, painted mostly in monochrome.9 After the tremendous critical success of the Oresteia, Hall developed his theory of the mask in The Oedipus Plays (London, 1996) and Bacchai (London, 2002), collaborating again with Herbert. Perhaps inspired by the popular reaction to Hall’s work, the French director Ariane Mnouchkine’s production of Les Atrides (performed in various locations around the world from 1990-1992) drew on the Kathkali theatre traditions of India. Kathkali relies on heavily stylized makeup masks, that is, thick, colorful layers of makeup which completely disguise the face of the actor and create an alternative set of features and expressions. Like the helmet masks of Peter Hall’s plays, the makeup masks of Les Atrides served to shock the audience out of their learned habits of viewing and forced them to engage with the play in an unfamiliar way. The productions of Hall and Mnouchkine demonstrate that Greek tragedy can retain much of its original power, even when presented today, in a culture of significantly different structures and assumptions. Aspects of an alien theatrical tradition will require some efforts at translation on the part of both performer and audience, and, on the part of the director, a solution of a number of technical problems, such as speech, movement, dramatic interaction, and character expression, which I will address below. McCart emphasizes the initial difficulties experienced by actors thrust into an unfamiliar practice: “when actors who are not accustomed to the mask[s] put them on, they suffer disorientation and restriction. They forget lines they have learned. They do not know what to do with their hands . . . To the observer it appears that their bodies are too small for the mask; they look, comically enough, like walking tadpoles.”12 McCart goes on to relate that this awkwardness soon gave way to a greater understanding and to the incorporation of a vocabulary of gesture—what the Greeks called cheironomia, “gesticulation.” In fact, J. R. Green has suggested that formalized, mimetic gestures probably accompanied speech in ancient performance, underscoring important ideas, phrases, or words in the text.13 McCart’s remarks on the central role of dance and gesture influenced the way in which the masks of my Agamemnon were designed and integrated into the production. As part of a tradition dating back to 1880, every third autumn the Oxford Classical Drama Society produces a play in Ancient Greek. Planning and rehearsing for Agamemnon took the better part of a year.In November, 2007 I presented the idea of a masked production of Agamemnon to a board of students and professors, and in December I was chosen to serve as director of the project. My initial proposal described masks as central to my conception of the play, which I imagined would be symbolic and highly stylized. The idea of using masks was met with hesitation from the members of the board, and from our faculty supervisor, Oliver Taplin, who thought the practical and technical challenges of working with the unfamiliar medium might prove insurmountable. Nonetheless, seeing that I was determined to pursue the matter, Professor Taplin put me in contact with two designers: Helen Damon, an assistant at the Archive for Performances of Greek and Roman Drama (AGPRD) at Oxford, and Vicki Hallam, a theater and film designer in London. 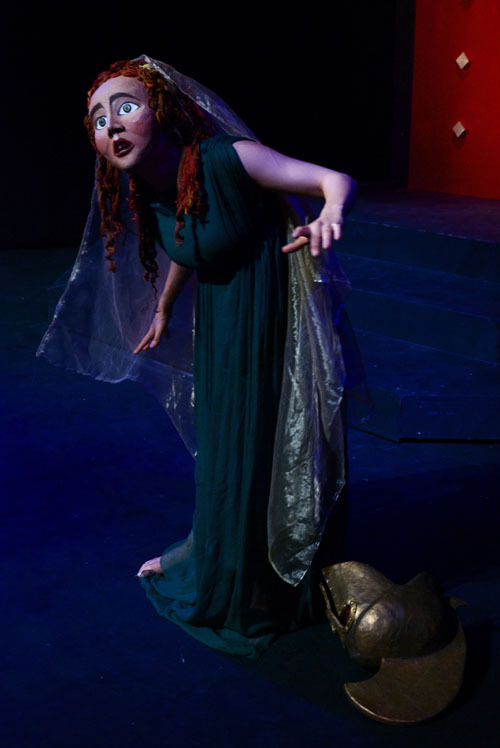 Damon, a former student of Taplin, wrote her undergraduate thesis on the function of the tragic mask in 5th-century theatre and has worked on numerous productions as a costume, hair, and make-up designer. Hallam has been an active designer in masked productions of Greek tragedy for the past thirty years and served as an assistant to designer Jocelyn Herbert when Peter Hall’s production of the Oresteia traveled to Epidauros in the summer of 1982. After an initial meeting, we arranged that Damon would prepare detailed sketches of the masks, which Hallam would then render as objects. Over the course of several weeks, Damon and I discussed how we wanted the masks to function in the play. We imagined that our use of masks, like our use of music and dance, would celebrate the spirit of the ancient story. (It was of course impossible to reconstruct the original modes of performance.) The formality and discipline of masked acting, we hoped, would force our actors to focus their attention on performing the literal meaning of the text. Finally, the masks were intended to effect a transition from the familiar theater of facial acting and usher the audience into a strange, formalized world of symbolism and metaphor. From the early stages of the design process, Damon and I agreed the masks should be representations of the human face with enhanced features, particularly eyes and mouths. Unlike the original masks of Greek tragedy, we imagined that each mask would be tied very strongly to a particular character, capturing essential aspects of attitude and behavior. The masks, then, would support the audience’s understanding of the action, and the unfamiliar spoken Ancient Greek, by giving them a visual lexicon of the various personalities of the play. Damon was particularly interested in the relationship between performer and mask. She designed the masks in the hope of mitigating the initial stage of “disorientation and restriction” for the actor described by Wiles and McCart. Especially for those actors who had never before worked with masks, the challenge was to forge a three-way bond between the performer, the character, and the mask. The masks were to be seen as a means to transform, not a means to disguise; without the mask, there was no character. To this end, we began with the face of the actor. The cast was in place by late spring, and consisted of graduate and undergraduate members of Oxford University. We chose our performers on the basis of three specific skill sets: classicists and actors for the six speaking roles, singers from the various college choirs for one hemichorus, and dancers from the University dance group for the other hemichorus. The choral function was split to maximize the technical expertise of the performers, so that the six male singers remained mostly stationary during the odes while the six female dancers enacted their words with movement. The design process began with a series of meetings where Damon and I discussed the central traits of each character. We then met with each of the six speaking actors: the Watchman, Clytemnestra, the Herald, Agamemnon, Cassandra, Aegisthus, and the chorus leader. Damon created “mood boards” for each mask, with images of the actor’s face juxtaposed with photographs of historical figures, sculptures, animals, and fictional characters. Thinking of the masks as somewhere between real people and symbolic objects, Damon isolated certain features of shape and coloration in each actor’s face. For instance, Kassandra Jackson, the actress playing Clytemnestra, has fair skin, pale blond hair, blue eyes, and somewhat angular features. Next, we thought about aspects of character that we wanted the mask to convey. The text emphasizes Clytemnestra’s strength, resourcefulness, and androgyny—she is the woman who thinks and acts like a man. Damon then created a sketch that combined the facial structure of the actress with the strength and cruelty of the character (Fig. 1). The finished piece resembles the actor, but key features are exaggerated and carry the potential for stark symbolism (Fig. 2). From Damon’s sketch and measurements of the actor’s face, Hallam shaped a mold in clay. She then made a plaster cast of the mold, which she lined with layers of brown paper and a mixture of wallpaper paste and PVA glue to make papier maché masks. She then returned the paper masks to Damon, who painted them in acrylics. Hallam also constructed felt headpieces, which Damon sewed to the back of the masks in order to cover the actors’ heads completely. Hair was made from treated yarn in various colors, which was stiffened and styled with cornstarch. When worn, the color of the mask matches the skin tone of the actor to create the illusion of a seamless line from head to shoulders (Fig. 3). The masks were created as a set, with internal similarities and oppositions. This required seeing the actors as physiologically true to their characters – not by virtue of typecasting, but by virtue of imagination. 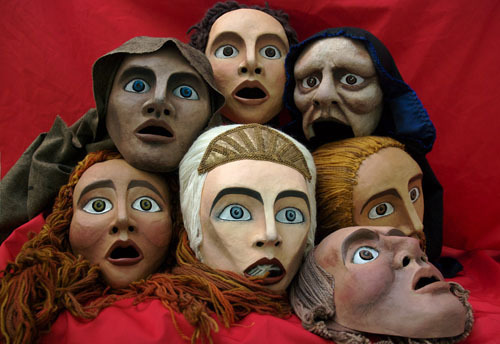 The masks were designed as a stylization of the actors’ faces in the direction of the character. 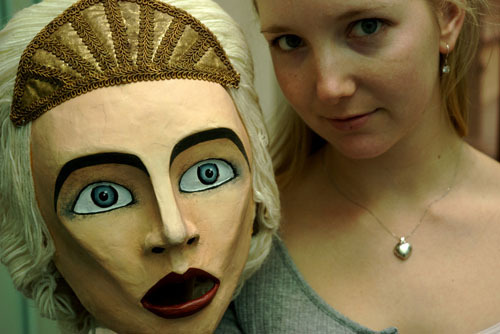 For example, the relationship between the play’s two female characters is reinforced by the contrast between their masks. 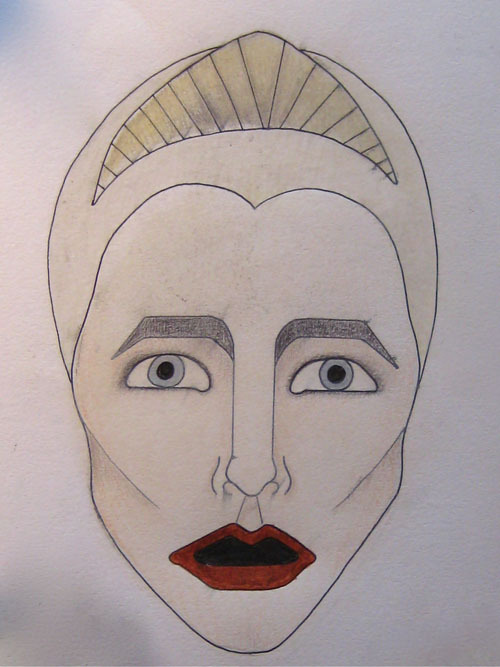 Damon painted Clytemnestra’s mask in cool blue and white tones, with a red mouth; its lines are angular, and the hair is pulled back from the face and elaborately arranged. By contrast, Cassandra’s mask is painted in warm tones, with rounded features and loose, reddish-brown curls (Fig. 4). All of our masks also emphasize the role of the eyes. Unlike the masks of Hall’s Oresteia, which have almond-shaped holes in place of eyes,14 we agreed on brightly painted irises that would recall the inlaid eyes of ancient statues or the painted eyes of tragic masks, with only a small crescent cut around the pupil for visibility. In the finished masks, the eyes often provide a clue to aspects of character: the mask for the Watchman, for instance, has blue eyes that stand out from his weather-beaten and browned face in order to emphasize his vigilance and his hope that all may yet turn out well when his master returns (Fig. 5). Clytemnestra, too, is marked by her decade-long wait for her husband’s return, and her “icy” and “steely” resolve is visible in the eyes of her mask. Cassandra’s role as a prophet emphasizes her “second sight,” which allows her to see the interpenetration between human action and divine causality that remains hidden for the other characters; Damon accordingly gave her round hazel eyes under raised eyebrows, as if in permanent wide-eyed shock at the visions she is doomed to see but can never communicate to others. Paradoxically, it was this very gaze that communicated what she was seeing to the audience. The actors saw sketches and photographs of their masks at every stage of the process, and they accepted the finished products as intimately tied to the characters. Damon met with each actor for an individual fitting, and it was in this personal, even intimate setting that the actors were first “introduced” to their masks. I asked all actors to provide special boxes, lined with cloth, in which to store their masks, and I encouraged them to keep the masks with them between rehearsals. The actors’ responses to the masks were by no means without ambivalence; at times, the stylization began to intrude upon the actor’s identity. Kassandra Jackson, our Clytemnestra, took to wearing her hair offstage in the same style as her mask. Guy Westwood, the actor playing Aegisthus, was initially upset that his mask had such chubby cheeks, which he said made him look weak and effeminate; over the course of the rehearsal process, he made this weakness an essential part of his portrayal of the character. When we began to work on specific scenes in rehearsal, we reinforced the importance of the mask at every stage. An actor and I would talk through a block of text together, making sure we understood every word of the Greek and blocking out major shifts in tone and argument. When that particular piece of text was memorized, the actor would put on his or her mask, always facing away from the audience to effect the transition, and then recite the speech. Notes and discussion were withheld until the actor had removed the mask, again facing away from the viewer. I never addressed the character in mask, only the unmasked actor. In this way the work done in bare face was a rough and preliminary sketch of the scene, which was never “performed” without the mask. The actors were encouraged to treat the masks not as props, but as quasi-magical objects that bridged the gap between rehearsing a text and actually becoming a character. I asked each actor, more or less explicitly, to create and define a special relationship with his mask, whereby the mask was actually approached as if it were animate. To me the process was analogous to children in a game endowing their playthings with motive and will, intuitively and through imagination. My hope was that in putting on a mask, the actor would partly merge with the character that he had allowed the mask to become. Musical rehearsals were led by our choral director, Oliver Hamilton, and dance rehearsals were led by our choreographer, Jessica Bland. All twelve members of the chorus had to adapt their familiar performance style to the challenges and limitations of the mask. Early in the design process, Damon and I had decided that the chorus would wear three-quarter masks, with upper lips but no chins, for reasons of cost and audibility. When we began rehearsals, the singers found that the molded papier maché upper lips of the mask changed the quality of sound as it emerged, and that it was more difficult to come in on the right pitch with their ears covered by fabric cowls. After several experiments, we decided to cut away the lips of the mask entirely, leaving the lower cheeks intact. This freed the singers’ voices considerably. The resulting masks looked at times alive, yet uncanny, because of the way in which the mouths moved while the other features remained stationary. The chorus masks as a set were less wrought than the character masks. This difference was originally motivated by economy, but the plainer masks proved in fact desirable, because in the odes I wanted the audience’s attention to be drawn to the whole figure of the dancer rather than primarily to the face. Our dancers had perhaps the greatest adjustments to make. Bland, our choreographer, had planned several of the choral odes before returning to Oxford in September. Trained in the school of Martha Graham, Bland created complex, intensely balletic dances that often required the six dancers to be perfectly synchronized. 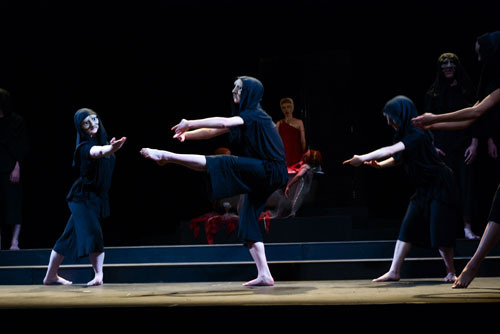 The many leaps and turns proved very difficult to execute in masks, which limited peripheral vision, affecting the performers’ balance and ability to pick up cues from one another. After weeks of rehearsing, Bland and the dancers decided to simplify some of longer sequences and to change several group dances into solos in which the individual dancer could respond to the rhythm of the music without worrying about the movements of her fellow dancers. Thus the demands of the masks shaped the dances towards simplicity, teaching us that the mask functioned in counterpoise to other elements and at times had to be deemphasized in order for dance to move to the front plane. The masks of Agamemnon were designed with modern performers and a modern audience in mind, and as such are very different from their ancient counterparts. The challenges facing actors, dancers, and singers who want to work with masks today are difficult, but by no means insurmountable. Our work suggests that if masks are integrated into the rehearsal process from an early stage, even actors who have had no formal physical training will be able to master the technique. This mastery is greatly facilitated by the development of an animating relationship between actor and mask, which the director can foster by providing a conceptual framework of imaginative interaction, as well as through specific rehearsal practices (e.g., never addressing the character in mask, allowing only the actor to wear the mask). The demands of masked acting led us to adopt a gestural, frontal style of performance. The actors and I reached this conclusion through experiment and through watching other actors; group sessions were especially productive in this regard. For our dancers, the practical challenges were at least as great, and radical simplification was required. Some choreography—many pirouettes in a row, canons—proved impossible. The primary aim of the masks of our Agamemnon was to specify and define the bonds between actor and character and between character and audience. The character was defined through the interaction between actor and mask, a symbiosis without which no drama could be created. We wanted the audience to see neither the actor nor the mask, only the character composed of the two. Because the characters did not look naturalistically human, they appeared, in the rehearsal room and onstage, to be both less and more than human: their limited repertoire of movements and expressions took on a symbolic, mythical significance. By using masks, actors of varying degrees of experience and expressive gift were able to enter imaginatively into the cosmic cycle of crime and punishment narrated in the Agamemnon. The masks allowed us to transcend our particular historical moment and to refer the story to a higher plane of meaning and metaphor. This subjective account is offered in the hope that it will shed light on the ways in which masks may be used today, and that it will encourage other performers to try their hand at the unfamiliar technique. To obtain photographs, video, or more information about this production of the Agamemnon, please contact The Archive of Performances of Greek and Roman Drama at Oxford (www.agprd.ox.ac.uk). My thanks go to Helen Damon and Vicki Hallam for their beautiful creations; to Henry Uniacke for his equally beautiful photographs; to the performers of Agamemnon for their dedication and insight; and to Oliver Taplin, Fiona Macintosh, David Wiles, and Amy Cohen for their valuable advice and critical feedback. 1 I should make clear that my approach was primarily informed by the work of directors and performers, in particular the subjective accounts of Hall (2000) and Lecoq (2000). There are also classicists who have affected such a union of theory and practice, in particular David Wiles and Gregory McCart, whose work I shall discuss more below. 4 Vernant (1990) 24, 382. By an “aesthetic” role Vernant appears to mean that the primary function of the mask is to render a character visually identifiable, and to underscore the distinction between tragic hero and tragic chorus. 8 For detailed discussion of the Peter Hall Oresteia, focusing especially on the role of music, see Taplin (2005) 235-251. 9 Verbal descriptions, sketches, and photographs can be found in Herbert (1993). 12 McCart (2007) 252. This comment does not suggest to me that the masks were physically enormous, but rather that their use was unfamiliar to the performers. Over the course of centuries, iconographic evidence suggests that the shape and size of the Greek mask changed greatly; cf. Wiles (2007). The modern productions which I have been discussing all use masks that are more or less the size of the human head. 14 See Herbert (1993) for sketches and photographs. The effect is especially unsettling in the case of the otherworldly white-faced Furies, whose empty eyes recall the gaping sockets of human skulls. Cassandra in Hall’s Agamemnon does have painted irises and pupils, perhaps to emphasize her role as prophet and seer. 15 Damon and I were delighted to notice this same behavior among the satyr chorus members on the Pronomos vase! 16 I did not encourage the actors to work in front of a mirror with their masks, as I found it made them too self-conscious; but neither did I forbid it. Jackson, who had been trained as a dancer and gymnast, had a greater awareness of her body in space than many of the other actors, and found the mirror to be a useful tool. Some of the other performers and I experimented with videotaping their monologues in rehearsal; we would then watch and comment on the tape together, and often the tapes helped the actor to be more confident and make larger, more expressive gestures. Most effective were group sessions, where the actors picked up new techniques from watching each other. Calame, C. 1986. Facing Otherness: The Tragic Mask in Ancient Greece. History of Religions 6:125-142. Easterling, P. E., ed. 1997. The Cambridge Companion to Greek Tragedy. Cambridge. Foley, H. 1980. The Masque of Dionysus. Proceedings of the American Philological Association 110:107-133. Green, J. R. 2002. Towards a reconstruction of performance style. In P. E. Easterling and E. Hall, eds. Greek and Roman Actors: aspects of an ancient profession, 93-126. Cambridge. Hall, P. 2000. Exposed by the Mask: Form and Language in Drama. London. Halliwell, S. 1993. The function and aesthetics of the Greek tragic mask. Drama 2:195-211. Herbert, J. 1993. Jocelyn Herbert: A Theatre Workbook. C. Courtney, ed. London. Lecoq, J. 2000. The Moving Body. D. Bradby, trans. London. Macintosh, F., P. Michaelakis, E. Hall, and O. Taplin, eds. 2005. Agamemnon in Performance, 458 BC to AD 2004. Oxford. Marshall, C. W. 1999. Some Fifth-Century Masking Conventions. Greece & Rome 46:188-202. McCart, G. 2007. Masks in Greek and Roman Theatre. In M. McDonald and J.M. Walton, eds. The Cambridge Companion to Greek and Roman Theatre, 247-267. Cambridge. Pickard-Cambridge, A. 1988. The Dramatic Festivals of Athens, second. ed. revised by J. Gould and D. M. Lewis. Oxford. Scullion, S. 2002. ‘Nothing to do with Dionysus’: tragedy misconceived as ritual. Classical Quarterly 52:102-137. Vernant, Jean-Pierre and Pierre Vidal-Naquet. 1968. Myth and Tragedy in Ancient Greece. New York. Wiles, D. 2004. The use of masks in modern performances of Greek drama. In E. Hall, F. Macintosh, and A. Wrigley, eds. Dionysus Since 69: Greek tragedy at the dawn of the new millennium, 245-263. Oxford. ------ .2008. Mask and Performance in Greek Tragedy: From Ancient Festival to Modern Experimentation. Cambridge. A PDF of this piece: Volume 8, Number 12.